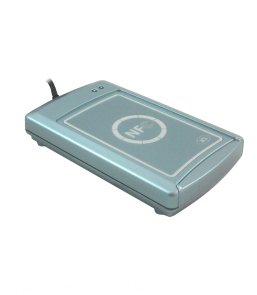 The ACR122S NFC Contactless Smart Card Reader is a serial interface reader in the ACR122 family based on 13.56 MHz contactless (RFID) technology and compliant with the ISO/IEC 18092 Standard for Near Field Communication (NFC). It supports MIFARE, ISO 14443 Type A and B, FeliCa and NFC cards and devices, including all three NFC modes (reader, card emulation and peer-to-peer) and four types of NFC tags. The ACR122S comes with a built-in ISO 7816 SAM slot for enhanced security, plus an internal buzzer and two LEDs for rich user interaction. Also included is a cable with a standard 9-pin serial connector for data communication, plus a USB connector for power transmission either from a PC or a separate power supply. The reader is enclosed in a larger case than the standard ACR122. Developers of new applications will need to purchase the ACR122 Serial SDK first. The ACR122S is compatible with Read-a-Card, the contactless card ID reading application, useful for the integration of RFID technology into new or existing systems.